It’s Saturday night, and you’re at a party. It’s getting kinda late, but nobody wants to leave yet. The conversation has dropped off, though, so everybody’s just kinda sitting around looking at their drinks. Strip Roulette gives you a wheel and a plan. Presumably, you’d pass the phone around or designate one person to be the Keeper of the Wheel, and people would take turns spinning and removing the item of clothing pictured there. It’s classy. I’ve always liked Pipe Dreams, the puzzle game about quickly throwing down tiles with pictures of pipes on them to guide a Mystery Fluid from its source to an endpoint, but I’ve always thought it was missing something. 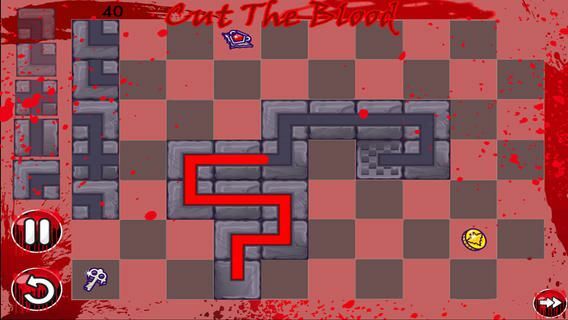 I never realized what that something was until I found Cut the Blood in the App Store. Blood. It was missing blood. I’m being ridiculous there, and of course any version of Pipe Dreams is going to be fun because hey, it’s Pipe Dreams. But when the fluid was green, I never really bothered to guess what it was. I just knew that I needed to get it to that goal before it got everywhere because nobody wants green stuff on them. Still, blood can be gross. Nobody wants that on them, either. So I’m going to give this one to you, Cut the Blood. You just go on being crazy. Here’s a frankly insane-looking version of Fruit Ninja that is all about cutting balloons with King Arthur’s legendary blade. 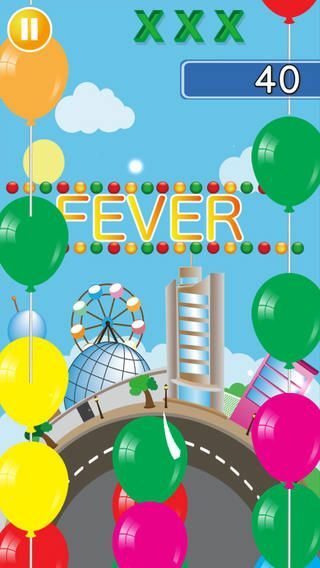 It has the same game-ending bombs as its precursor, but it also includes gold balloons that give you time bonuses and one of the most eventful backgrounds possible. And if you miss three swipes, you lose. But it’s a little late for rules at this point. It’s a game from Japan that revels in its Japan-ness but not so much that it doesn’t opt for a sword from English mythology over, I don’t know, a samurai sword or something. But hey, katanas are played out, you guys. Broadswords and claymores are coming back in a big way. Honestly, it doesn’t matter because eff balloons. Seriously. They think they’re so cool. Pile up more！ – $0.99 | SIMS CO.,LTD. Alright, so I seriously have no idea what’s going on here. 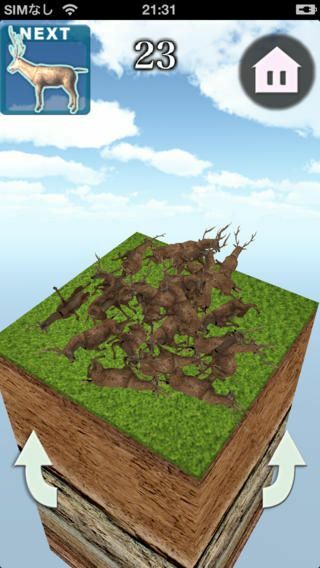 This is apparently a game about making piles of fish and deer. And it has two modes for each: alive and dead. And it scores you … somehow. I’m going to guess that Pile Up More is about stacking as many of the animals on the giant Minecraft brick as possible without any of them falling off. And the challenge ramps up when the beasts you’re heaving about are alive because they’re squirming around and stuff. Or maybe you’re trying to arrange the animals to cover as much of the ground as possible without piling them up. What a twist that would be, huh? That is all I have. Those are my best guesses. I don’t know; maybe it’s great. Maybe it’s the dead-animal version of Tetris. I just don’t know what I’d say if anyone saw me playing it. I was all ready to write this whole thing about how this game doesn’t make any sense, and nothing on the App Store page was helping me out at all. But then I took the 10 seconds to hop over to Google and look it up and discovered that Nanaca Crash is a Flash game about launching a dude through the air and into other people by hitting him with a bike. You can play it here, and I recommend you do because otherwise this app is just confusing. And also because it’s pretty fun. Even surprisingly so. Your success or failure is out of your hands as soon as you make the first click, but it’s entertaining to watch, even if the dude doesn’t fly as far as you’d like. So that’s the weirdest thing of all: I actually found a weird game that’s fun. I’m as shocked as anyone. Choice quotation: “Nanaca Crash app.” That is the entire App Store description, right there.